Please scroll down to see our breeding dogs' individual profiles and photo galleries. To meet our wonderful retired breeding dogs click here. To learn more about health testing, please check out the links on our health and wellness page. We breed only fully tested, medium and standard sized Multigenerational Australian Labradoodles from therapy and service dog lines. Our puppies have non-shedding, fleece coats that are great for allergy and asthma sufferers. They are sweet natured, intelligent, easy going, and intuitive, making them wonderful family companions, therapy dogs, and service dogs. Our breeding dogs are registered ​with the WALA and, many cases, the ALAA and ALCA. We are also proud to be recognized as a Premium Breeder due to the extensive health testing we do on our breeding dogs. Health: OFA Good Hips, OFA Normal Elbows, OFA Normal Eyes (2018), Normal Cardiac, DM, EIC, vWD, PRA and IC clear. Sparrow is a happy dappy social girl who loves everybody she meets. She is playful, snuggly, and joyful, not to mention always up for an adventure! She carries forward some of our best therapy lines, in a smaller package. Sparrow carries for all colours, including parti. She lives with her mum, Polly, in a wonderful guardian home. We look forward to adorable pint-sized pups from Sparrow, beginning in late 2018. Health: Hips OFA Good; OFA Normal elbows; OFA Normal eyes (2018); cardiac normal; patellar luxation normal, DM, EIC, vWD, PRA, and IC clear. Acorn loves life, and all it has to offer! She is extremely loving and affectionate, and is also a genius at finding new ways to have fun. Acorn is smart and biddable (loves to learn and learns quickly). Acorn's was one of those litters that I planned years in advance. I am SUPER excited to see her parents' legacies carried forward, and to see what she produces for us over the next few years. Acorn carries for all colours including parti. She is one of our smaller girls and will produce small - large mediums, depending on who she is paired with. Colour: Apricot cream carrying for chocolate (Bbee). Parti-factored. Size: Standard. 22 inches and 48 lbs. Health: Hips OFA Fair and Dr. Wallace (eVet Diagnostics) Good; OFA Normal elbows; OFA Cardiac Normal, OFA Patellar Luxation Normal. PRA, EIC, DM, vWD, and IC clear. Jewel is a sweet, happy girl. She has the gentle soul of her mum, and the striking good looks of her dad. Her gorgeous apricot cream coat, and ink black (nose) draw attention wherever she goes. I couldn't be more pleased to have the best qualities of Keesha and Marlo brought together in one adorable package! Jewel carries all colours and will produce all colours when bred to one of our chocolate boys. She is our gentle giant, and will produce larger sized pups. Health: Hips OFA Good; OFA Normal elbows; clear for PPG 11 Genetic Disease Panel, IC clear. Apple is Jasmine's daughter, Star's granddaughter, Ami's great granddaughter, AND a half sister to Monty! She is pure love! Apple is very lab-like in her demeanor, and can usually be seen weaving around people's legs, tail wagging, with a toy in her mouth. We love her adorable disposition, her compact (stocky) little body, and her beautiful chocolate/cafe coat. 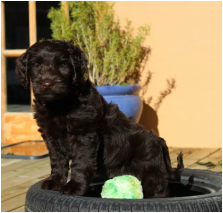 Apple is clear by parentage for all of the genetic diseases we can test for in Australian Labradoodles. We look forward to her puppies in the spring of 2018! Health: Hips OFA Good; OFA Normal elbows; OFA Normal eyes (2017); PRA non-affected; cardiac normal; patellar luxation normal, DM, EIC clear. Cricket is Keesha's daughter, Lily Pad's granddaughter, Flower's great granddaughter, and Firefly's sister. She is out of the first litter that Kodiak sired for us. I fell in love with Cricket the instant she was born, and held my breath for another year until she passed her health testing. Cricket has the solid build, the shiny coat, and the sweet temperament that are so sought after by Australian Labradoodle breeders. I am totally in love with this girl, and so delighted that she is one of our rising stars. Health: Hips OFA Excellent; OFA Normal Elbows; Cardiac normal; Patellar Luxation Normal, DM, EIC, PRA, IC Clear. Firefly is a full sister to Cricket. Their parents are Keesha and Kodiak. This is only the second time in all the years I've been breeding that I retained two puppies from the same litter. I was smitten with Firefly from the moment I saw her! She is a gentle, loving girl with a gorgeous red shiny fleece coat. Firefly's dam is one of my certified therapy dogs, and Firefly inherited her mother's temperament (along with her dad's extra waggy tail). I look forward to Firefly's puppies in 2018! ​Kodiak comes to us all the way from North Carolina. He is a wiggle bum, toy-toting, snuggle bug of a labradoodle! He comes from older Australian therapy dog lines. He is a gorgeous dark chocolate which is lightening to a striking lavender tone. At 18 inches and 38 lbs, Kodiak has that nice heavy boning that is so sought after in the Australian Labradoodle. Kodiak has sired some beautiful puppies for us here at Leapfrog Labradoodles as well as for other breeders. 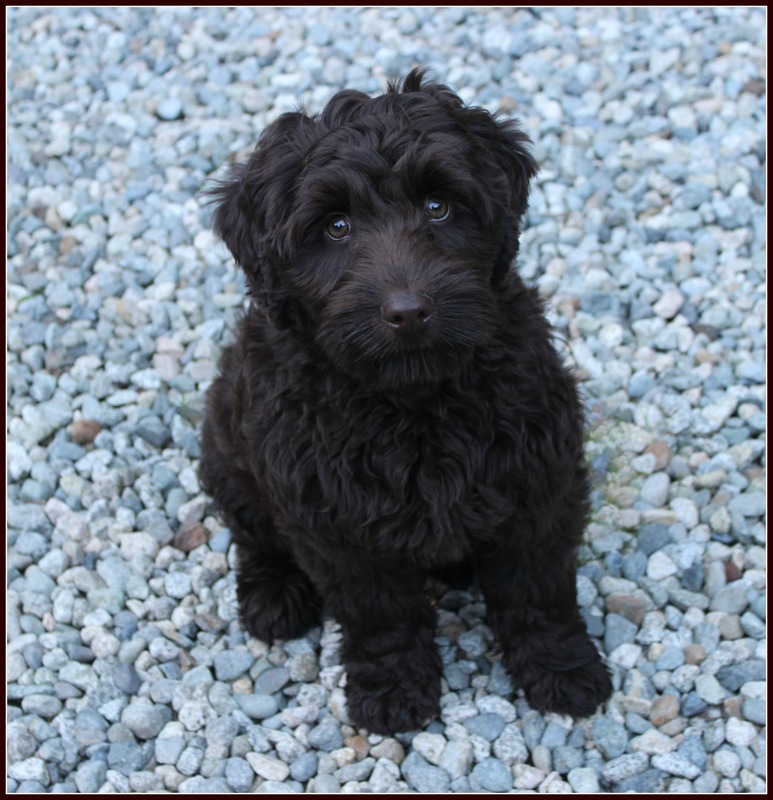 Monty comes to us from our friends at Sardis Park Labradoodles in Chilliwack. He's a sweet, intuitive boy. Monty is active and loves to run and play with his friends. He is very social, and loves everyone he meets (humans, dogs, cats). Monty will produce smaller mediums for us in all colours, including puppies with fun white markings like his. Monty has completed his testing. We can't wait to see his adorable puppies! Health: OFA Good hips, Normal Elbows, Normal Cardiac, IC clear, and clear for PPG 11 genetic disease panel - DM carrier (non-affected). Health: OFA Good hips, Normal Elbows, Normal Cardiac, Patellar Luxation Normal, Eyes Normal, IC , EIC, DM, PRA clear. Oliver is a the first male I've retained out of my own program. He is everything I had hoped for, and more! Oliver has a sweet, easy going temperament, and striking good looks. He is a 4th generation Leapfrog Labradoodle out of Bean and Marlo. We share Oliver with our friends at Sardis Park Labradoodles. I am very excited about the contribution that Oliver will make to both of our programs! We sometimes use studs from other reputable breeding programs to complement our own gene pool, accentuate certain desirable characteristics, and introduce new characteristics into our program. When using outside stud service, we have the option of working with breeding programs across the globe. We work only with programs that do extensive health testing, and we choose only studs whose offspring are eligible for registration with ALAA. Whenever possible, we travel to meet the stud in person before breeding takes place. 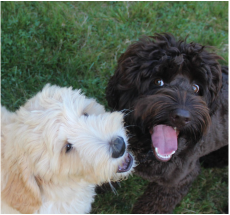 We take the privilege of raising these wonderful dogs seriously, and we are pleased to respond to any questions you may have about our labradoodles or our breeding program. With every breeding we strive to produce beautiful, genetically sound puppies that are gentle, joyful, and intuitive. Our program boils down to two goals: Happy dogs. Happy people. Click why leapfrog? to learn more. To meet our retired breeding dogs click here! ..the vast majority of your investment goes directly into maintaining exemplary standards in our breeding program. ﻿We donate a percentage of our revenue to local animal rescue associations. We regularly donate very special puppies to serve as assistance dogs for children or adults with disabilities. When you choose a Leapfrog Labradoodle, you are contributing to a better world for dogs and kids. Happy dogs. Happy people. That's our motto!